We at Magnon – Best Interior Design Architect in Bangalore believe there is a direct relation between Human mind and interior design. Interior designing is becoming a competitive field with lots of competitors. Designing interior according to mindset of person who is going to occupy space is an important task. If the design is according to mindset of person who is going to stay over there, then we can say it is a successful interior designing. Home is a place where people try to get some relaxation for their body as well as the mind. For most of the interior designer’s it is all about designing, but at Magnon we try to learn the mind of the client before designing. Further, it is scientifically proven that there is a direct relationship between interior designing and human mind. Bring home one of the best interior designing from the latest designs suggested by Magnon – Interior Design Architect in Bangalore. The Psychology is the study of human mind and how it is functioning. It states the behavior and characteristic of a person. Every human is said to have different behavior and characteristics. Psychology state that the interior designing of a home or workplace is where people get much more affected to the mind. As the same these places is where we mostly spend our times. Further, this can have affect on mood, thoughts, emotional and physical feelings. As well as this concept is well explained by many psychologists and architects. Even many studies have suggested that a room space with larger area can bring out creativity and inspiration, whereas rooms with lower space can help in focusing on a particular task. Same as external environment we at Magnon – Best Interior Design Architect in Bangalore believe that there is effect on human mind on the internal environment. Internal environment refers to interior designing. In the above, we have already explained in brief, there is a interlink between choosing . Interior should make you feel good and have the capability to feel positive as it further affects the health and well-being. For more our thoughts and feelings are easily influenced by our surroundings. And even it is relevant to make a good balance in color combination and make use of available space wisely as it may further affect the end result of the customers mind. Health of person can be affected very much by the interior designing. For instance – Interior designing with less area for air circulation can bring out respiratory problem for many such as asthma. Also a space with heavy air circulation can bring out cold or wheezing for a person who is not much experienced to cold climate. The Magnon – Best Interior Design Architect in Bangalore takes a good care for health issues with designing the best for your health. View to the good green natural external scenery with fresh air is what that can really help your mind relax. Fresh air can bring out good thoughts and creativity from your mind. Busy street scenes with huge traffics and numerous building is considered to be much more distracting and even tiring as they require more cognitive processing from the brain. Interior designing can also bring out some small plants within to have good air and provide greenery within environment. For person’s living in cities like Bangalore finding residential area with view of greenery is difficult task. Hence, such problem can be solved by adding greenery. And for a person living in apartment garden cannot be built. For the same we can build mini garden in balcony with lots of interior designing as hanging pots. Magnon also suggest that add greenery for peace of mind and relaxation with good thoughts and creativity. We should always choose wisely while selecting the furniture for the home or the office. It is said that furniture of wooden is better for health considered to that of artificial material. In addition to it while choosing furniture we mostly try to select curved or round shaped tables or chairs or other furniture compared to that of furniture’s having sharp or square shaped design. This is because we feel it is much safer in having round or curved furniture to that of other as there is not sharp corner for these shaped furniture. Lights also play an important role in human mental stability. Likewise, dim light at a dinner party gets guest feel much more relaxed. Whereas, having bright light in such as party, it will bring out an opposite effect. While considering to a home environment natural lighting can bring out much more pleasant mind for the person. Good sunlight and greenery environment is a perfect combination for your mind to bring out happiness. Effect of vice versa that is lack of natural light can lead to low moods and a depressive atmosphere in both the workplace and the home. Color also plays an important role in bringing out a pleasant mind for you. It has an enormous effect on the mood – any successful hotel or restaurant owner will testify to this. Color schemes and seating arrangements can be used to encourage people to stay and relax in anyone place by using soft colors, comfortable seating and subtle lighting. Harsh lighting, bright colors and hard chairs have the opposite effect and communicate that this is only a temporary place to wait in. Your furniture arrangement can also influence how much or little people interact in your home. Positioning seating against the wall discourages people from socializing, whereas positioning chairs in groups facing one another encourages interaction. 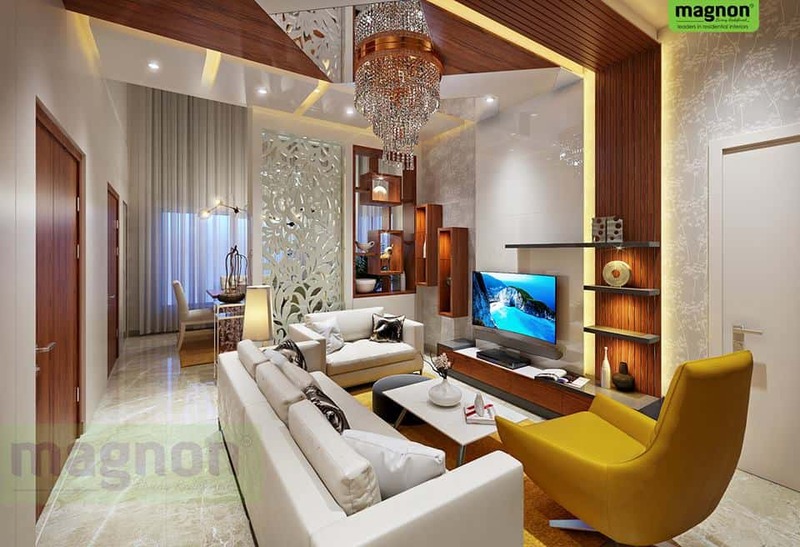 Magnon – Best Interior Design Architect in Bangalore have always kept in mind the nature and mindset of the client for whom the design is made for. Our designing will be guided by our experts who are in the field for more than 10 years. Our motive is thus to bring up a happy mind for you and your family with the concept of interior designing.